According to the FTC, Alex Guerrero faked being a doctor and claimed his products could cure cancer and concussions. These days, Guerrero’s business partner is the greatest quarterback of all time. By Chris Sweeney·	 10/9/2015, 3:24 p.m.
Editor’s Note: Three days after this story was published, Tom Brady responded on WEEI’s Dennis and Callahan program. 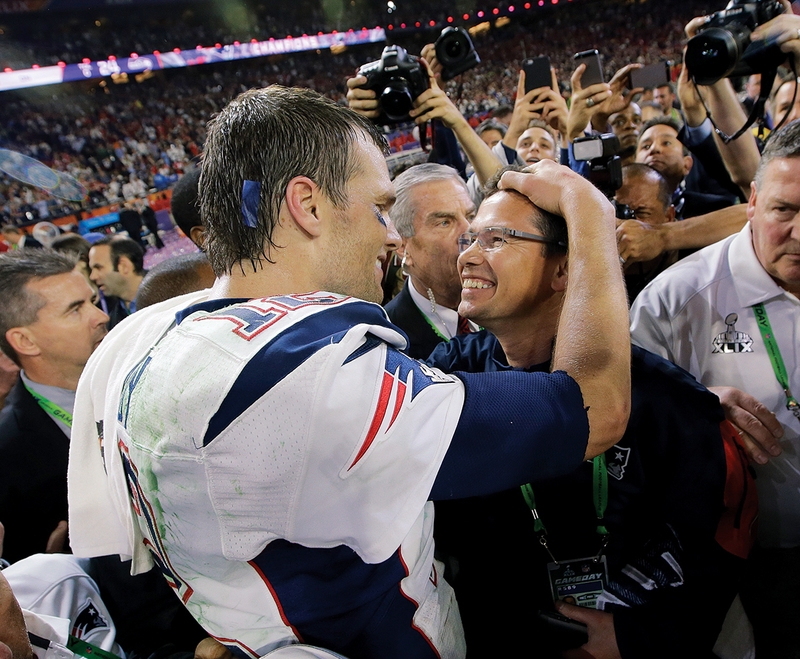 Ongoing Coverage: Tom Brady’s Guru Alex Guerrero Was Twice Sued For Fraud (October 2015). Alex Guerrero’s and Tom Brady’s TB12 Was Investigated By State Agencies (December 2015). He said his name was Dr. Alejandro Guerrero, and he had incredible news. At his California clinic, Dr. Guerrero had been testing a nutritional supplement that—he claimed, according to affidavits filed in federal court—produced miraculous results. He said he’d conducted “clinical studies” of 200 patients who’d been diagnosed as terminally ill. They were suffering from ailments such as cancer, AIDS, multiple sclerosis, and Parkinson’s disease. And eight years later, all but eight had survived. In the infomercial, which aired across the country on networks including Spike TV and Women’s Entertainment, Dr. Guerrero repeated his extraordinary claims about Supreme Greens to his viewers. The commercial was structured like a talk show, with an interviewer named Donald Barrett, from Saugus, asking Dr. Guerrero about his product and the 200 patients in his study. MR. BARRETT: Were they terminal? DR. GUERRERO: They were diagnosed as terminal. MR. BARRETT: Two hundred people. Now, eight years later, how many of them are still alive? DR. GUERRERO: Out of those 200 people that were terminal we lost eight. Eight passed away. If anyone cared to look closely, however, there were a couple of problems with Dr. Alejandro Guerrero’s claims. First, he wasn’t a doctor of any kind—not a medical doctor, as he admitted in the infomercial—or a doctor of Oriental medicine, as he claimed to business associates, according to a sworn affidavit. The FTC would eventually bar Guerrero from ever again referring to himself as a doctor. In truth, Guerrero’s degree was a master’s in Chinese medicine from a college in California that no longer exists. The other problem, of course, was that Alejandro Guerrero’s Supreme Greens was a sham. Total nonsense. Modern-day snake oil. “This is just out and out quackery,” says Barrie Cassileth, a bona-fide PhD in medical sociology and the founder of the Integrative Medicine Service at the Memorial Sloan Kettering Cancer Center, who helped the FTC investigate Supreme Greens. Turns out, Supreme Greens had never been scientifically tested. The “study”—the one in which Guerrero claimed that 192 terminally ill patients had survived thanks to Supreme Greens—never actually existed, he later admitted. The FTC found not a shred of evidence that Supreme Greens could cure or prevent cancer, AIDS, MS, Parkinson’s, or any of the other ailments Guerrero had mentioned. Cassileth says “cancer quackery” like Supreme Greens is a $40 billion-per-year industry. Over the years she has investigated dozens of similar products. And while the FTC did not allege that there was anything affirmatively harmful about Supreme Greens, Cassileth says that among the most pernicious effects of products like Supreme Greens is that they can delay cancer patients from seeking proper, evidence-based medical care. “This is fatal for many patients,” she says. That didn’t stop Supreme Greens from raking in an estimated $16 million in a span of 18 months, according to the FTC. Finally, the feds stepped in. In June 2004, the government sued Guerrero and the production companies responsible for creating and airing the infomercial for making unlawful claims and representing Supreme Greens in a deceptive format. “Consumers throughout the United States have suffered and continue to suffer substantial monetary loss and possible injury to their health,” the FTC wrote in its complaint. As investigators dug into the financial records behind Supreme Greens, it became evident that Guerrero had seen only a slim portion of the earnings. The “bulk of sales revenues,” the FTC said, went to the commercial’s host, Barrett, and two Beverly-based production companies, ITV Direct and Direct Marketing Concepts. Barrett was president of both companies, according to court records. Multiple attempts to reach Barrett were unsuccessful. In October 2005, the FTC announced a settlement with Guerrero. Court documents show that Guerrero was ordered to pay a $65,000 fine or hand over the title to his 2004 Cadillac Escalade. More important, the agency barred him from promoting Supreme Greens or “any substantially similar product” as an effective treatment, cure, or preventative for cancer, heart disease, diabetes, or any other disease. Multiple attempts to reach Guerrero were unsuccessful. An employee at TB12 said that Guerrero was not available Friday and requested an email, but did not respond to several follow-up attempts for comment. A Utah-based attorney who represented Guerrero was also not immediately available. The FTC also prohibited Guerrero from passing himself off as a doctor and set strict parameters for what he could and could not say regarding any food or dietary supplements. In some cases, the FTC limits its enforcement to a period of years. In Guerrero’s case, though, it was a lifetime ban: He was forced to promise, in essence, never to do it again. Spoiler alert: He did it again. Almost a decade later, the FTC discovered, Guerrero was hawking a new miracle product—a drink he claimed could prevent concussions. And this time, Guerrero would have a better pitchman than the “Dr. Guerrero” he’d played on television. He claimed to have Tom Brady—the greatest quarterback who ever lived, who by then was Guerrero’s new best friend. At the age of 38, Tom Brady has looked impossibly sharp this season. In his 16th year in the NFL, he is undefeated, with an astonishing 1,112 yards, nine touchdowns, and zero interceptions after only three games. He is legendary for his meticulous preparation for the game—mental and physical, year round, on and off the field. He studies hard; he knows his opponents’ tendencies better than they know themselves. He hasn’t missed a game in six years. There is universal agreement about who is responsible for Brady’s peak condition: Alex Guerrero, the hands-on architect of Brady’s comprehensive training program. Guerrero is far more than a sports therapist or Brady’s “body coach.” Earlier this year, the New York Times described him as Brady’s “spiritual guide, counselor, pal, nutrition adviser, trainer, massage therapist and family member”—not to mention godfather to Brady’s son, Ben. He controls every calorie that enters Brady’s system—and once joked that he knew Brady’s body better than Gisele. Pats wide receiver Julian Edelman once compared Guerrero to The Karate Kid’s Mr. Miyagi. Often described by his many NFL clients as an almost mystical healer, Guerrero is revered among players for helping them bounce back from injury. Of course, not everyone shares that adulation: Guerrero himself once admitted that some trainers regard him as “a kook and a charlatan.” But until now, no one has reported on Alex/Alejandro Guerrero’s dark past—or asked how it might affect Brady, the Patriots, or their future. Brady and Guerrero are not merely inseparable; they are now also business partners in TB12, LLC, which has a sports therapy center headquartered at Patriot Place next door to Gillette Stadium. Over the past year, major profiles in Sports Illustrated and the New York Times magazine have focused on the unique relationship between Brady and Guerrero, without even hinting at Guerrero’s checkered past. As Guerrero continues to be monitored by the FTC under his lifetime ban, TB12 will likely be under a microscope to back up claims about the extraordinary training regimen Guerrero has sold Brady—and which Brady and Guerrero are now selling to the world. Already, the Brady-Guerrero venture has produced a major misstep—one that brought the FTC storming back into Guerrero’s life. Though Guerrero had promised the FTC never to make outrageous claims about his supplements, by 2011 he had a new company, 6 Degree Nutrition, and a new miracle potion. Introduced at a time when NFL players, in particular, had become hyper-aware of the effects of head injuries, it was called NeuroSafe—a “seatbelt for your brain” that promised to protect users “from the consequences of sports-related traumatic brain injury.” The label boasted that the product was “Powered by TB12.” Guerrero, the snake-oil salesman, was back in business. On the website for 6 Degree Nutrition, the company’s founder wasn’t a doctor anymore. That part, at least, was true: By the time Brady came under Guerrero’s spell, the trainer had become a kind of cause célèbre among NFL players. Former Patriots linebacker Willie McGinest told 98.5 the Sports Hub’s Toucher and Rich that he met Guerrero, who had been working with track athletes. McGinest was immediately sold on Guerrero’s unorthodox approach, and was soon flying him to New England. At first, according to McGinest, the Patriots “wouldn’t let [Guerrero] in the building,” so instead McGinest had Guerrero work with him during private sessions at his house. Around 2006, word of Guerrero’s ability to heal the afflicted with his hands quickly spread throughout the locker room. Eventually, McGinest told Toucher and Rich, the Patriots “started letting Alex come to the facility and work on me. And Tom, a bunch of the other players, Bill Belichick, experienced what he can do and how he can help players and keep players on the field.” Guerrero’s uncanny skill soon garnered a following: “Nobody can do what this guy can do,” McGinest said. Pats wide receiver Danny Amendola told The Providence Journal that Guerrero “does a great job of getting your muscles right, getting everything where it needs to be.” Brian Hoyer, Brady’s former backup, told Sports Illustrated that he called Guerrero regularly for advice while rehabbing a torn ACL. At the time, Guerrero was working with more than just the Patriots. According to McGinest, who could not be reached for comment, he was tending to players all over the country —Kansas City, San Diego, Cleveland, and Indianapolis. It appears that he was contracted by individual players, not the teams: Both the Chargers and Colts say they never employed him. But as Guerrero’s value among players grew, the Patriots reportedly saw him as a competitive advantage. They “locked him in full time. They cut all the other teams out. They made him a deal he couldn’t resist,” McGinest told the Sports Hub. “And Tom locked him up as well.” From Brady’s 2008 ACL injury on, according to Sports Illustrated, they were inseparable. Guerrero’s official role with the Patriots is unclear. There is scant reference to him on the team’s website. 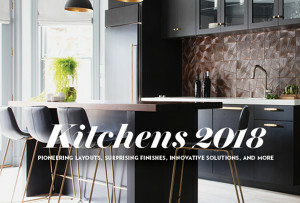 One story from this summer on the Patriots’ website about fun recipes for the Fourth of July refers to Guerrero as Brady’s “body coach.” Stacey James, a spokesman for the Patriots, declined at press time to comment and did not reply to an email about the team’s relationship with Guerrero and TB12. By 2011, though, Guerrero was thoroughly entrenched in Brady’s camp and had treated numerous Patriots players. His cadre of NFL heavyweights was reflected on 6 Degree Nutrition’s website, where a page called “Our Team” claimed “The quality and effectiveness of our products has earned the trust of hundreds of professional athletes. The Six Degree Nutrition team of professional athletes have tested our products at the highest level.” Beneath that statement were photos of Brady, Edelman, Wes Welker, Matt Cassel, LaDainian Tomlinson, and other pros. Guerrero’s company 6 Degree Nutrition sold several supplements: One, called Prolytes, was a combination of “natural trace minerals from sea water concentrates, purified water, and potassium chloride”; another, Endurance & Recovery, was touted as an all-natural pre- and post-workout supplement. But the one that quickly caught the FTC’s eye was NeuroSafe. 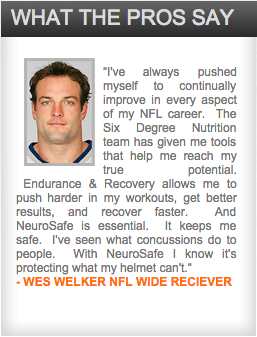 NeuroSafe makes me feel comfortable that if I get a concusion [sic] I can recover faster and more fully. There is no other solution on the market today that can do what NeuroSafe does. It’s that extra level of protection that gives me comfort when I’m out on the field. There’s also the NeuroSafe label itself. Just below the supplement’s required nutritional information appeared the words “Powered by TB12,” with the TB12 done up in Brady’s personalized logo. The full extent of Brady and Welker’s involvement with these promotions is unclear. Ryan Williams, of Athletes First, the agency that represents Welker, did not respond to several messages. Calls to Don Yee, Brady’s agent, were not returned before press time. The FTC then did something surprising: “Despite our concerns,” the agency wrote in a letter, it declined to bring an enforcement action against Guerrero. The reason, according to the FTC, was because Guerrero had sold an “extremely limited volume” of NeuroSafe, had decided to discontinue marketing the product, and had agreed “to provide full refunds to all consumers who purchased the NeuroSafe product.” In essence, the FTC agreed to back down only after Guerrero promised to stop marketing NeuroSafe. “This action,” the FTC wrote for good measure, “should not be construed as a determination that there was no violation” of Guerrero’s previous consent decree or other FTC regulations. And yet the FTC’s letter and the shuttering of 6 Degree Nutrition doesn’t seem to have driven a wedge between Brady and Guerrero—if anything, they are closer together than ever. In May 2013, barely a year after the FTC issued its letter on NeuroSafe, Brady and Guerrero officially went into business together, registering TB12 as a limited liability company in the state of Delaware. According to a 2015 state filing with the Massachusetts secretary, the principal managers of the company are Guerrero, Brady, and Peter Bernon, an executive of the dairy company Garelick Farms and a friend of Patriots owner Robert Kraft. The company’s counsel is Robyn Glaser, who is also general counsel for the Patriots and a VP for the Kraft Group. Guerrero dispenses his own line of nutritional supplements through TB12, which he assured me he tested independently to ensure compliance with the league’s drug policies. Brady, too, told me he was “absolutely” sure nothing he was ingesting could get him into trouble. So far, there’s been no infomercial for TB12—but then again, the company doesn’t need one. Both magazine pieces about their partnership—in Sports Illustrated and the Times—have been fawning in their praise for Guerrero and Brady’s regimen. Those accounts have, in turn, spawned dozens of articles broadcasting the details of the Guerrero/Brady partnership around the world. Brady, after all, is the ultimate advertisement for Guerrero’s uncanny blend of supplemental nutrition, massage, resistance training, and other hands-on techniques. And the claims that Guerrero and Brady have made about their techniques might seem fanciful, even absurd—if they weren’t backed up by the facts of Brady’s incredible career. He started in 128 consecutive games from 2001 through September 7, 2008, when he tore his ACL in week one. He came back one year later, and hasn’t missed a game since. Calf muscles, sore shoulders, strained groins—Guerrero has successfully mended Brady for nearly a decade. Part of Guerrero’s plan has been a single-minded devotion and a relentless personal attention to Brady’s injuries. Hoyer, Brady’s former backup, once recalled an incident where Brady broke his finger and Guerrero spent the day beside him, massaging the injured appendage during meetings. Guerrero reportedly crafts his eating habits and employs a relentless fitness schedule. The program is methodically mapped out for years into the future, according to the Times. “We work on staying physically fit, emotionally stable and spiritually sound,” Guerrero said in the article. Of course, just because it’s worked for Brady—one of the world’s most remarkable athletes—doesn’t mean it’ll work for everyone else. And because of Guerrero’s past and the lifetime consent decree still in place against him, he’ll continue to be under the eye of the FTC’s enforcement division as he blossoms into the NFL’s sage of wellness. It’s strange enough that a player with Brady’s obsessively manicured image is so closely associated with someone who once hawked bogus cancer cures and anti-concussion elixirs. And it’s hard not to wonder, given Guerrero’s track record, whether Brady’s business partnership could expose him to similar questions and investigations. But in true Patriots form, it doesn’t matter what everyone thinks. The only thing that matters is what works. And as far as Brady appears to be concerned, Guerrero works.